I am an absolute caffeine addict and must have a cup of coffee every morning–no, not Starbucks, but cafe sua da -Vietnamese iced coffee. Cafe sua da is coffee made with rich dark French roasted coffee with chicory (an herb that’s roasted and used to flavor coffee) and condensed milk over ice. It’s stronger, bolder, and richer than iced coffee at Starbucks and it’s so much cheaper and easy to make. All you need to make cafe sua is a Vietnamese coffee filter press and coarsely ground dark roast coffee–any type will do but preferably with chicory such as Cafe du Monde and Cafe Trung Nguyen. 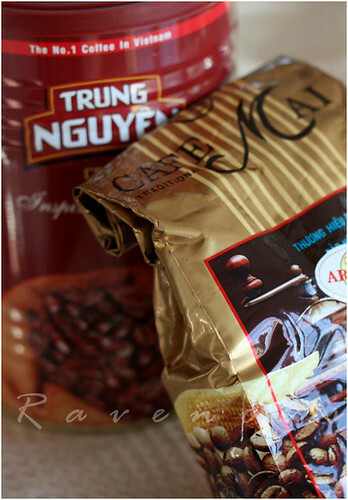 Recently, our friend Anh from Food Lovers Journey was so kind and sent us a bag of coffee from Hanoi called Cafe Mai for us to try and it was great–thank you, Anh! In a small coffee cup, add about 2 tablespoons of sweetened condensed milk (adjust amount to your tastes). In the coffee press, add about 2 tablespoons of ground coffee and screw press on snugly, but not too tight. When done, set the press aside and stir well. Pour over a large ice filled glass and enjoy. How fast the coffee drips effects the strength of the coffee. The tighter the filter, the slower the drip, the stronger the coffee. I’ve also tried it with half the amount of condensed milk and used fat-free French Vanilla half and half and it turned out great with half the amount of calories! This is the perfect beverage when I need a jump start in 115 degree weather in Arizona. Vietnamese Iced Coffee is the bomb! My mom brought a Vietnamese coffee filter/press back from her trip to Vietnam for me, along with coffee laced with chicory. I love it! Yum! I love Vietnamese coffee too. Thanks for the tips on how to make it traditionally using the coffee filter press. I've always wondered how to use those. I've always loved Vietnamese Iced Coffee! 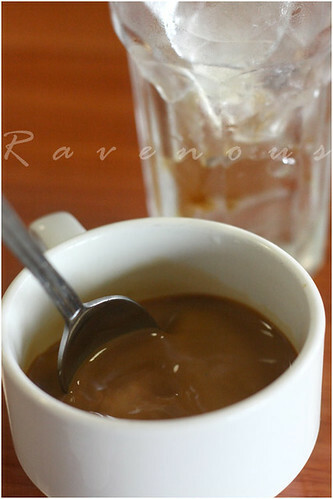 The rich, sweet condensed milk with strong coffee is like dessert but so refreshing simultaneously. Really amazing stuff, forget Starbucks! natalie: cafe su da is always more satisfying to make on your own and Trung Nguyen coffee is very good. Jessica: Those Vietnamese coffee filter are the best for only a few bucks! Chow and Chatter: We'll have to check that out. Thanks for letting us know. Jen: Cafe sua da is really easy once you do it a few times..give it a try! My favorite drink when the weather is hot! I love Vietnamese coffee and the photos are a nice reminder of sweet childhood memories of trying to sip from my mom's glass of iced coffee. I did not realize that it was chicory that added that smoky flavor! Thanks for the informative post, I'm looking forward to picking up Cafe du Monde on my next trip to the Asian markets. I adore Vietnamese coffee, but haven't made it for ages. I even have the press – no excuses! Your pictures are wonderful, as usual. I would love to try Vietnamese Iced Coffee! It sounds just wonderful! I recently had Vietnamese coffee at Baoguette in NYC, and was hooked! Thanks for showing me how I could do it at home! elra: Vietnamese iced coffee is heavenly on a hot day..
5 star foodie: we hope you can make vietnamese iced coffee sometime! erin: let us know how cafe sua da goes for you when you make it! Vietnamese coffee is one of the best I've had but it is really very strong as I stayed awake like an owl the whole night! I have a similar coffee press too which I bought in Hanoi many yrs back. 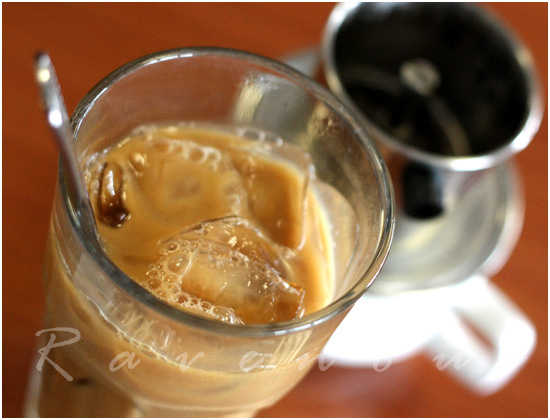 petite nyonya: cafe sua da can definitely be strong–staying up the whole night–yikes! that's why we don't drink it too quickly and let the ice melt a bit first! Lovely coffee. I like this. I'm starting to love coffee with condensed milk. Yummy. 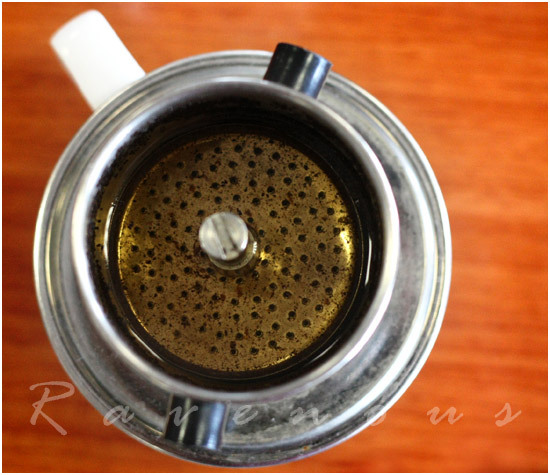 I was wondering if you are making the Vietnamese cafe for a large group, can you use a french press?? @stacy: yes, it should work. you can also make it in advance too. some restaurants that don't have the drip method make it advance and just keep in tightly sealed and refrigerated. I love this!! I go to cabramatta and canley hts (sydney australia) all the time to have this!! so much betterthan gloria jeans or starbucks!! love to have it after pho! I recently “discovered” cafe sua da and love it. I have tried to recreate at home and have not been having success; I just can’t get that same great strong flavor. It seems like I am getting a cup of caffeine that upsets my stomach more than anything. For such a simple device, I think I just haven’t mastered the phin yet. I recently tried to really tighten the filter and that gave me a better cup, but still a little to much caffeine and after almost 10 minutes only half the water had gone through the coffee. I will keep experimenting on getting the right “tamping” of the coffee but not so tight the water doesn’t do it’s job…..but I would love some tips if you have any. For coffee I have used the Trung Nguyen gourmet blend and premium blend and have tried mixing in some espresso roast ground as well. Estou no brasil e não sei onde posso conseguir esse café, vocês que já são acostumado a degustar essa bebida, posso substituir por qual café, e esse filtro também tem como substituir? daniel : 1/2 Café Du Monde and 1/2 Trung Nguyen , mix it together and try it.